The total market sales of global medical devices have jumped to $555.3 billion in 2015 from $187 billion in 2001, with CAGR (2001~2015) of 8.08%. 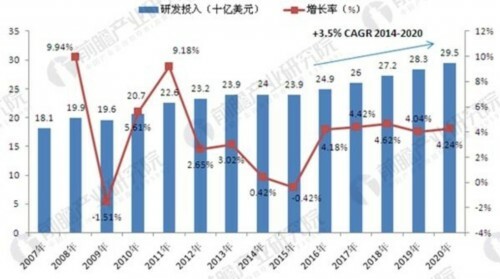 Even in 2008 and 2009, the years of global economic slump, the medical device industry realized a growth rate of 6.99% and 7.02% respectively against the current, higher than the growth rate of pharmaceutical market in the same period. It is expected that by 2020, the global investment in medical device will reach $29.5 billion, with a CAGR in 2014~2020 of 3.5%. However, the growth rate of R&D investment is expected to be lower than that of the sales. Meanwhile, the overall R&D and sales ratio will drop to 6.2% in 2020 from 6.4% in 2014. However, the R&D investment ratio of the Top 20 companies in the industry will reach 7.7% in 2020, higher than the overall industry level. With increased investment in R&D, the global medical device industry development scale is expected to be expanded. In 2015, the sales volume of global medical devices was $555.3 billion, with a CAGR of >8% in 2007~2015, while the AAGR of pharmaceutical market sales was around 5% in the same period. It is expected that the global medical devices market will maintain a growth rate of 4%-7% in 2016~2021, and the market scale in 2021 may exceed $720 billion. In general, the opportunity of global medical devices outweighs the challenge. 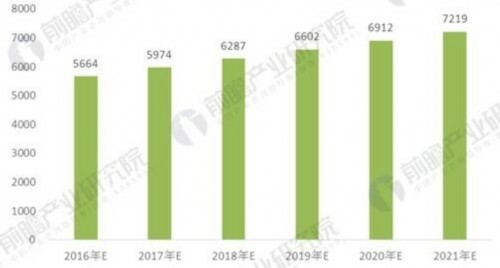 The main challenges of the global medical device industry include the falling sale price, the increased supervision, and the controlled hygiene expenditure pressure of the payer. Nevertheless, there are some positive factors in the global medical device industry to maintain the industry growth: aging of population, increase of chronic diseases, and rise of emerging medical device market.